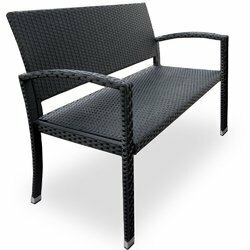 We offer a Wide Range of Garden Furniture like Garden Benches, FRP Benches, Wicker Benches, Rattan Benches, Cast Iron Benches, Balcony Benches, Terrace Benches. A Elegant Looking 2 Seater Outdoor Wicker Bench with a Coffee Table in the Centre to enjoy that wonderful cup of Tea / Coffee in the morning. Best Suited for Terrace, Balcony, Garden, Hotels & Resorts. This is a wonderful 2 Seater Garden Bench made in Artificial Cane (Wicker). It is All-Weather material and the Outdoor Bench is best suited for Gardens, Terraces, under Gazebos, In Restaurants, Coffee Shops, Etc. 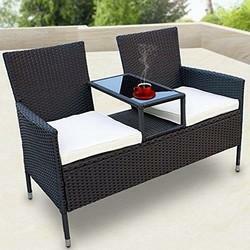 This contemporary design of Wicker Bench gives your Terrace / Garden a wonderful look. With its unique weaving style, this Wicker Outdoor Bench seats 2 people comfortably. 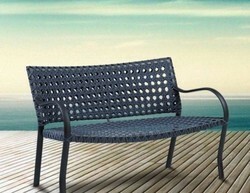 We offer more designs in Garden Benches, Outdoor Benches, Wicker Furniture. 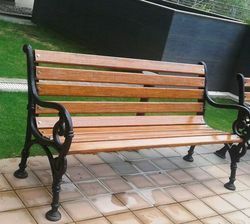 Our Luxury Outdoor Garden Bench is made with Synthetic Wood which is All Weather Material and does not need any Polishing or Varnishing or Maintenance like in natural wood. The Luxury Outdoor Garden Bench looks classy and make a statement when placed outside your Shop or Residence. Best suited for Outdoors in Gardens, Terraces, Porch, etc. 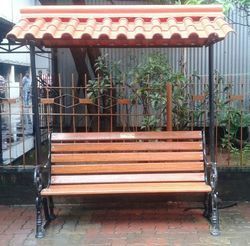 We offer the Deluxe Garden Bench with Top Roof for sun shade and rain cover. Our Garden Bench with the Roof is an excellent choice for Outdoors in Garden & Terraces. The above Garden Bench without Hand Rest is made with all-weather FRP Seating in Wood Effect with Cast Iron heavy duty Stand. 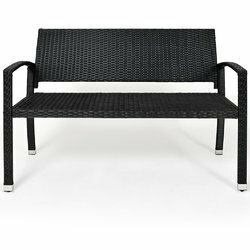 Our Garden Bench without Hand Rest is a 3 Seater / 2 seater bench that goes well in Outdoors like Garen, Terraces, Parks, Porch, Veranda, etc. Our Imported Wooden Garden Bench comes with an elegant Designer Cast Iron backrest that adds to the elegance. 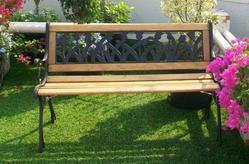 Our Wooden Garden Bench is Imported and comes as a 2 Seater with natural wood and cast iron stand. An Economical optino to add outside your House, or in Garden, or on Terrace. 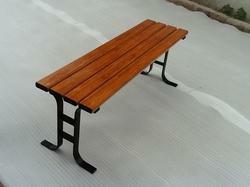 This is our Economy Garden Bench meant for Outdoor & Indoor use. This bench comes without a Back rest & Handrest. Made with All-Weather FRP Seating, our economy outdoor bench is a cost effectiveoption for adding a Bench Seating for your private Balcony or Terrrace or Bakcyard Garden. Our Deluxe Garden Bench is a 3 Seater bench for Terrace, Garden, Balcony. 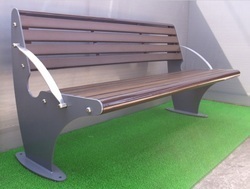 Deluxe Garden Bench offered with Weather proof FRP Seating in Wood Effect & Cast Iron heavy stand.